You have to write the [blog post] that wants to be written. And if the [blog post] will be too difficult for grown-ups, then you write it for children. My metaphor may land askew (not the first time), but as a simple person thrust into a strange new world by sheer circumstance, maybe he was foreshadowing web 2.0– and his child like basic perspectives is what so engaged people around him. In thinking about this session, I kept returning to the value and power of “being there” with all of this exploding technology. 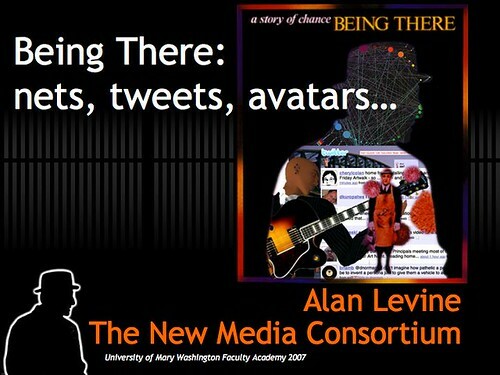 Today was my main presentation for Faculty Academy titled Being There: nets, tweets, avatars… in which I blitzed the audience with 71 slides, mostly flickr’s creative commons licensed images matching my warped metaphors, where I aimed to paint a picture of the distributed and perhaps unfamiliar online social or community space such as twitter, flickr groups for interests you would have never heard of, comment blogging, and a whiff at Second Life. My suggestion is that ‘expertise’ embodied in a single person is a quasi myth, and the suggested route is to “be” in your own constructed network that provides distributed expertise. Anyhow I had fun. People laughed. 75 minutes flew by. You can find the presentation graphics and links, notes as a flickr set and as a slideshare show (yes I used PowerPoint, mainly for this purpose- not too happy with slideshare- it does not preserve hyperlinks or keep the info in the notes field). Can’t wait for the audio. If only I could have been on I-95 and in University Hall at the same time. Grrr. But I’ve got a custom bootleg, heh heh. Looking forward to spending some quality time with this. You’ve captured something very profound here, Alan. In fact, I think you’ve nailed it. Wow!! Still absorbing, reflecting…but wow!!!! It was nothing fancy, Tim. The presentation was done in PowerPoint, the first thought being I could then post it to slideshare– but it seemed flickr offered more to add content in the captions. So I saved the 70 some slides as JPEGs, uploaded to flickr using the Flickr Uploadr tool, adding just simple titles I then used the organizer to reverse the order (since they came in reverse order). Then it was a matter of cutting/pasting some of the notes I had from PPT, and adding more, hyperlinks, etc. Super job, Alan! Is there an .mp3 of the keynote? I’d love to hear what you had to say.